Have you ever wondered what does it mean to you when you decide to say No to a Financial Planner, who is doing up a financial needs analysis and at the same time recommending some insurance plans to you? Basically the role of a Financial Planner is to make you realize or indirectly disturb you emotionally with a Problem (concern about Medical Bills, not enough for Retirement or the means to save enough for your Child’s University Education) through a Financial Needs Analysis Process. And after doing so, he will recommend a set of solutions to the above problems by means of committing to a certain range of Insurance Product – Endowment, Investment-Linked Plans, Medical Insurance and/or Critical Illness Insurance. The objective of this post is not to tell you much about what a Financial Planner does for a living and here I will assume that the Financial Planner who may be attending to you is capable of doing what he/she is required to do in Financial Planning. Should you pass away prematurely – think of the debts you may have leave behind directly or indirectly and also the family members whom have depended on you while you are still alive. Should you have not enough for Retirement – you can’t depend entirely on the Government as the Government has already laid out the steps for you to reach your retirement. You will not be able a job fast either as jobs are competitive now. Seen the many old Uncles and Aunties selling tissue papers? Therefore you may not need a Life Insurance Product but you will need what Life Insurance is able to create. You will definitely need money, peace of mind, certainty and pride and also if given enough time and proper means, you may be able to have enough money that’s required for any of the above mentioned or more. But if you do not have the time and eventually end up dying prematurely, insurance will create the lump sum money and insurance is the only product guaranteed to create the cash when your family needs it the most. By doing proper budgeting, you and I do have the means to set aside money for emergency, have a comfortable daily lifestyle and even to have enough money to pay the premium for a insurance plan. If Critical Illness is a major concern to you but you are not willing to pay for a whole life critical illness insurance plan, go for a Term Plan instead. Term Insurance is commonly known for low premium but High Sum Assured. And if you cannot really even tell yourself that you can afford this, which can be just setting aside few tens of dollar per month for around hundred thousands of Sum Assured, think of how your family will cope financially against escalated medical bills or future expenses when the amount of money that you have now is what they will have and after factoring in inflation, the value of your money drops! You may also be Asset Rich and whenever it’s needed the most, you may have to liquidate it and the worst scenario is that your Buyer will want to negotiate the lowest price possible which can be lower than the current market value. Think of that! At least with a Life Insurance, your beneficiaries will know with certainty the amount they can receive. I do have many Prospects who like to wait – get their first car, back from a holiday, when they strike lottery first before they are ready to commit to an insurance plan. And do you know that Waiting is a Cost as well? How is that so? A likely event – a sudden pain today lands you in a consultation with a Specialist and you happen to know the worst scenario! So what actually happened as you wait – you have to pay more as compared to before, you may lose out in returns or you may not get a plan at all even though you are willing to pay any amount in exchange for multiplied times. 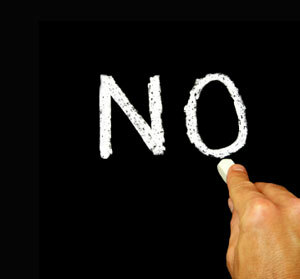 How ready are you to say No now? If you are saying No to avoid the pestering of a Insurance Product Peddler, do remember not to say No to a Financial Planner who has your interest at heart!